Contractual disputes, whether between two businesses or between a business and a consumer are filed in the Superior Court, Civil Part. Stemming from a debt or other contractual matter: 6 years from the date of default or breach of contract. Stemming from malpractice (medical or other professional): 2 years from the date of malpractice. Wrongful Death and negligence: 2 years. 35 days from the date of service. (Beware: proper service does not always have to be by Sheriff or other process server. Certified and even regular mail can constitute good service depending upon other factors). Up to one year for excusable neglect. Unlimited for lack of personal jurisdiction. Motion to Vacate default should always be done as soon as possible. ** All of the above are subject to exceptions. You should immediately seek legal advice if you have a question in regard to time limitations. This is not a complete list of statute of limitations. I handle collection matters, contract disputes, and commercial matters for BOTH plaintiffs and defendants. If you are being sued, or you expect to be sued, please contact me for a free consultation. I will advise you of your rights and if I can suggest more than one option as to how to handle the matter (what is a good strategy to reduce what is owed?) or how to present a defense (has the person or company suing you complied with the laws protecting consumers? ), I would be happy to advise you of my thoughts. 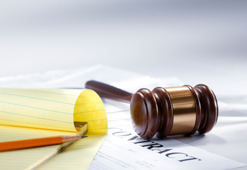 If you failed to respond to a lawsuit, AND NOW HAVE A JUDGMENT AGAINSDT YOU, do not delay. The law limits the amount of time you have to overturn a judgment, and the one year anniversary is a critical date.